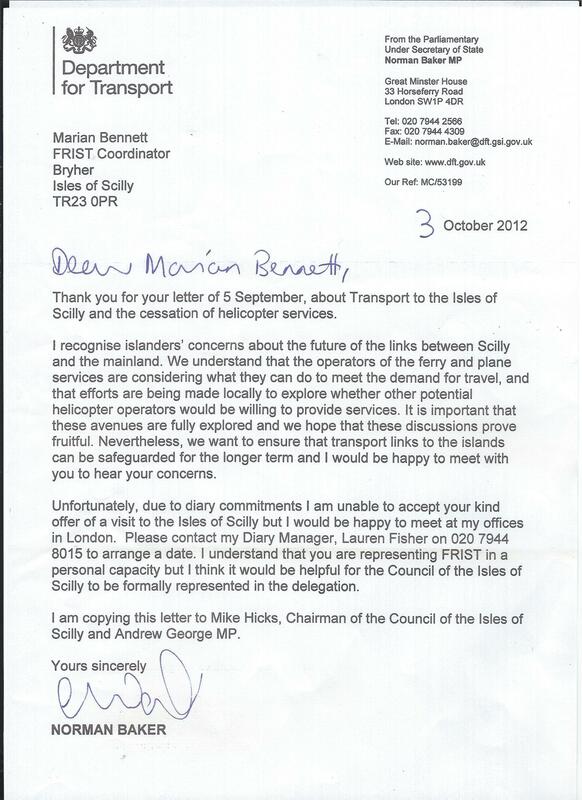 The Friends of Isles of Scilly Transport (FRIST) campaign to get a reliable, affordable, all year round lifeline passenger service to the Isles of Scilly is gaining traction with Norman Baker inviting FRIST to meet his in London on 1 Nov. The delegation will include representation from the IOS Council. Penzance Chamber of Commerce is founder member of this campaign which acknowledges the importance of Scilly's tourism based economy to West Penwith and especially Penzance. Fog resulted in Skybus having to suspend flights today from Lands End Airport. A number of tourists due to fly out today have been accommodated in Penzance overnight and are due to sail out on the Scillonian in the morning.